Kersten McCall, since 2005 principal flutist of the Royal Concertgebouw Orchestra Amsterdam, was born in Freiburg, Germany as son of composer Brent McCall. He grew up in Donaueschingen, where the Donaueschingen Festival for contemporary music is still held every October. It was in this rich musical environment that McCall took up the flute at the age of nine. He later studied with teachers such as Felix Renggli, Renate Greiss and Aurele Nicolet. Between 1997 and 2005 he was principal flutist of the Radio Symphony Orchestra Saarbrucken, Germany. Kersten McCall is first prize winner of the Kobe International Flute Competition and won prizes at competitions like ARD Munich, Prague Spring and Mendelssohn Wettbewerb Berlin. 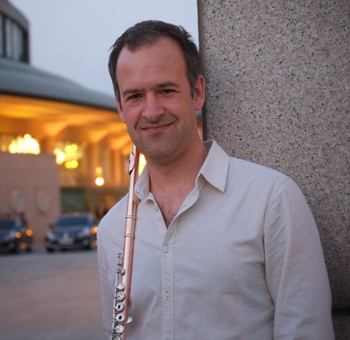 He has been invited as guest principal flutist to orchestras like the Berlin and the New York Philharmonic, the Orchestra of the Bayerische Rundfunk and the Chicago Symphony Orchestra. As a soloist he has played with the Royal Concertgebouw Orchestra, the Camerata Academica Salzburg, Les Violons du Roy, the Radio Orchestras of Saarbrücken and Hilversum, the Sharoun-Ensemble and many others including conductors such as Kurt Masur, Sandor Vegh, George Benjamin, Martyn Brabbins, Bernard Labadie, Michael Stern, Petr Altrichter and Ruben Gazarian. He has toured many countries in the Far and Middle East, South America, Russia and most European countries. 1996 he founded the ensemble est!est!!est!!! for contemporary music and performance which won several prizes in Germany. Kersten McCall is a member of the Linos-Ensemble and is teaching at the Amsterdam Conservatory.